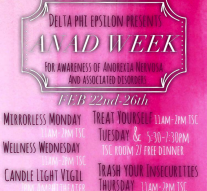 This week is “ANAD Week” for Delta Phi Epsilon (DPhiE). Throughout the week, the DPhiE chapter at Tarleton State University is promoting positive body image and encouraging eating disorder awareness through their philanthropy, the National Association of Anorexia Nervosa and Associated Disorders (ANAD). ANAD’s purpose is to raise awareness for all kinds of eating disorders, such as anorexia, when a person develops an emotional or physical negative response to weight gain, or bulimia, when a person may overeat and purposefully vomit in order to lose weight. To build on the idea of positive body image, DPhiE will be holding events this week, coordinating with a theme and activity such as the “Be a Kid Again” dinner and having a candlelight ceremony on Friday. 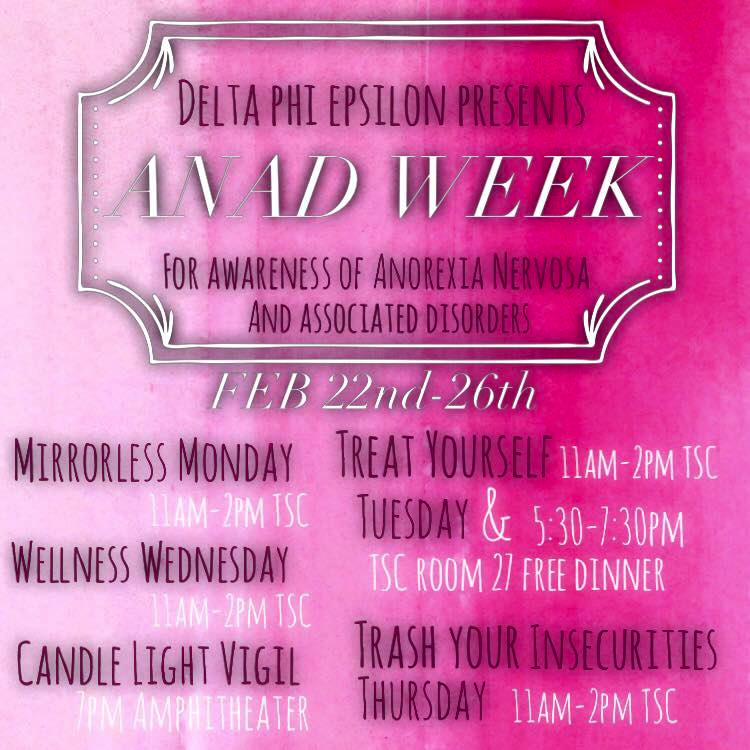 Yesterday was Mirrorless Monday for DPhiE’s ANAD Week. Emily Cowart, the DPhiE Philanthropy Coordinator, said that there was a booth set up yesterday in the Barry B. Thompson Student Center, and the members passed out handheld mirrors with positive messages written on them. Cowart said that, by about 1:30 p.m., they had given away all of their mirrors, an estimated 250 of them. 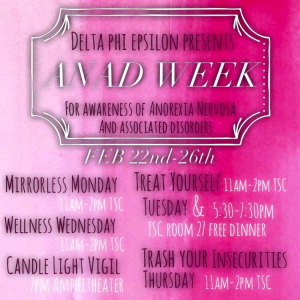 Delta Phi Epsilon is hosting their philanthropy event this week, which promotes positive body image. Visit them in the Thompson Student Center. Neeley explained the reason behind the “Be a Kid Again” dinner that will be held tonight. “When you’re a kid, you aren’t as susceptive to society’s way of thinking. You’re not going to care as much about what other people think. That’s why we’re encouraging people to come and eat for free at our dinner just to kind of raise awareness…to not care about what other people think,” said Neeley. The dinner is free for all attendees and will be downstairs in the student center tonight from 5:30 to 7:30 p.m.